President Park Geun-hye called for a change in the nation’s economic paradigm to foster coprosperity between conglomerates and small and medium-sized firms. She made the instruction during policy briefings from the Ministry of Trade, Industry and Energy and the Small and Medium Business Administration at Cheong Wa Dae on Monday. 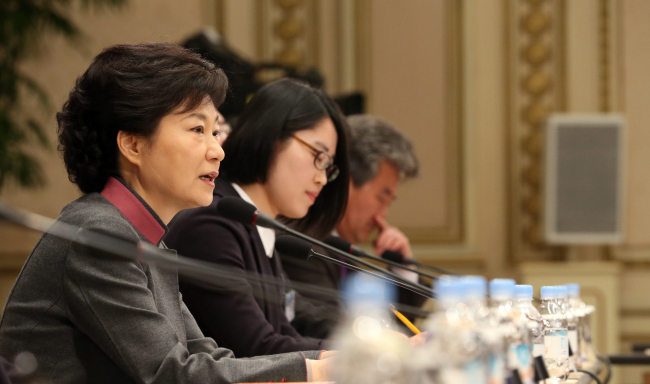 “Our economy reliant on big companies should be transformed into an economic structure where exports and domestic consumption are boosted simultaneously, and conglomerates and SMEs prosper together,” Park said. The nation’s economy should also create an environment which encourages creativity and ideas in a knowledge-based society, Park added. Requests for price cuts even after signing a contract are among the major issues that suppliers of chaebol have often faced while doing business in Korea. “It is time to correct deep-rooted and unfair business practices conducted by big business groups for the healthy growth of industries,” Minister Yoon Sang-jick said. The ministry will share the results of the investigation with owners and top management of chaebol to encourage them to voluntarily penalize employees who abuse their power in doing business with suppliers, which will compel other players in the market to follow suit, ministry officials claimed. In addition to the investigation, the ministry will also launch a cash payment monitoring system, first targeting public organizations to oversee whether they pay their suppliers as mutually agreed upon. “The ministry expects that the payment monitoring system will spread into the private sector later,’’ Yoon said. Along with the policies to improve market order, the ministry also promised to invest in cultivating globally competitive SMEs. “The ministry sets a goal of increasing the number of SMEs that export $100 million a year to 300 by 2017, from 116 in 2011,” Yoon said. To achieve the goal, the Small and Medium Business Administration under the ministry will draw an action plan, which will be responsible for the promotion of not only SMEs but also mid-sized companies. “As President Park mentioned, the most important principles of the MOTIE policies will be protection and promotion of SMEs,” a MOTIE official said. Like other economy-related ministries, MOTIE will also put its focus on creating jobs during a low-growth era. “The ministry will seek industry conversion among industries, including information technology, biotechnology and cultural sectors, based on close cooperation with the Ministry of Future Science to find a new growth engine for the economy and create quality jobs,’’ Yoon said. The nation’s trade policy will also face a shift following the transfer of trade-related departments from the Ministry of Foreign Affairs to MOTIE. “Most of all, the new trade policy will focus on how to create maximized synergy effects with industries and to support local companies to further penetrate the global market,’’ Yoon said. The ministry said it will develop a road map for future trade agreements based on the previous FTA negotiations in an attempt to transform those valuable experiences into intellectual properties during the first half of the year. Regarding the energy policy direction, Yoon presented safety as a keyword. The minister also noted the need to restructure overseas businesses of energy-related public companies and improve their financial health.